Great hike! I love the tracking with basecamp, I keep forgetting to take my GPS along for hikes and have been meaning to use it like this. Had the chance to get out and enjoy the woods at Hartman Reserve this afternoon. Gorgeous day to be out Ofg. It's always fun to look for wild things in the woods. I played peek-a-boo with this one for a couple of minutes before moving closer and having 10-12 run off. Can you see her? On Tuesday evening, February 3, 2015, I ventured out to Crumbacher Wildlife Area to take part in a Full Moon Snow Shoe Hike sponsored by Buchanan County Conservation Commission and Fontana Park. There was a pretty good turn out (about 20 people). The area we hiked is a prairie with fire breaks mowed around the outside and through the middle. Along the west side is a stream with a wooded area and there is another wooded area on the northeast corner of the prairie. The area we snowshoed in was pretty much flat. It was a beautiful night to be out, about 20-25 degrees with no winds. Although it was overcast, when the moon came up around 7:00pm, it became noticeably lighter. If it had not been for the clouds, it would have been an amazing evening. 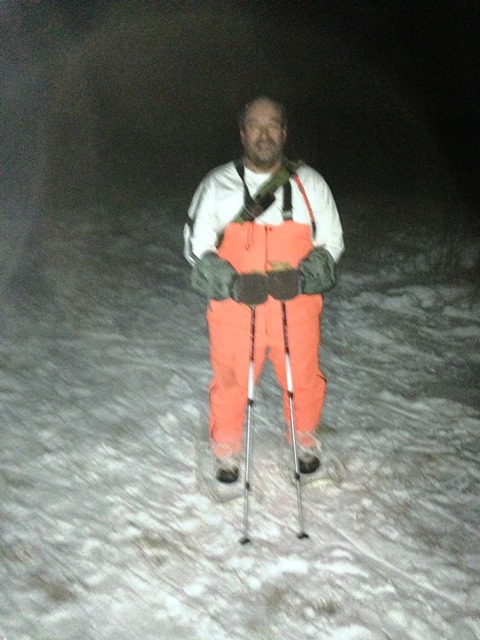 I started out heading to the back of the prairie and after about 1/2 a mile, I shed the ski jacket and hat. Once I did this, I was pretty comfortable moving at a relatively fast pace. Overall, I was out for two hours and covered 3.5-4 miles. It was a great workout on snowshoes. Here I am at the end of the evening. 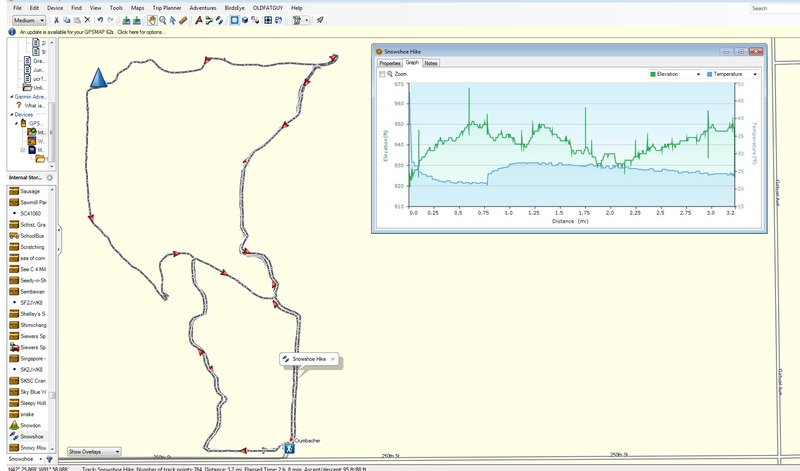 Here is the track from my GPSr for the hike. The inset shows elevation on the top in greet and temperature in blue along the bottom. You will notice a little bump up in temp at about .75 miles. This is where I took off my ski jacket and strapped it on the back of my pack. The temperature sensor was not covered, but this was enough to move the temp up a degree or two. it was a lot of in, Sharen, but a lot of work too. Made you appreciate how difficult it was to travel before roads and snowplows.